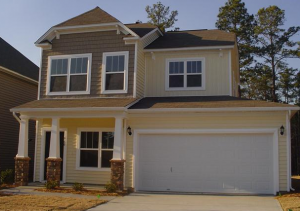 Ashland Mills is a family oriented community located in Blythewood, South Carolina. Built by Mungo Homes, this newly developed community is a great alternative to the other neighborhoods in Lake Carolina. The collection of traditional homes come with a variety of features and home amenities, but the real plus of Ashland Mills is the affordability. Starting in the low $100,000’s, new home buyers can find lovely houses that satisfy almost every requirement you could have. From welcoming living areas to spacious bedrooms, you’ll feel relaxed and comfortable in your new Columbia home. Blythewood stands apart from Columbia in one way: its community. Steeped in local tradition and family values, Blythewood has been a haven for those looking for a small, quaint community they can cherish. Local shops and restaurants offer tasty treats residents love going back for, and nearby schools are among the best in the Columbia area. But living in Blythewood doesn’t mean you’re contained to the town. Columbia is a short drive away, where you can easily get to work or spend a weekend in the city for fun entertainment. Overall, it’s the perfect location for homeowners who love smaller communities while still being connected to the bigger city. If you’d like more information about Ashland Mills, give us a call at (803) 358-0888 or email us via our Contact Page.